+ Bonus Pink Pomelo Moisturizer 2.25oz Free! Dive down into your depths with Hempz Ocean Waterz Deepest Detoxifying Bronzer where you will find dark, bronze radiant color you didn’t dream existed. The incredible combination of Pink Pomelo and Himalayan Sea Salt are a mix of antioxidants and powerful detoxifiers that help leave glowing skin refreshed, energized and dare we say younger looking. Enriched with 100% Pure Natural Hemp Seed Oil fused with our Sea Moisture Complex consisting of red algae and coconut water, Shea Butter and Vitamins A, C and E help provide the added moisture and conditioning leaving your tan skin feeling soft, smooth and supple. 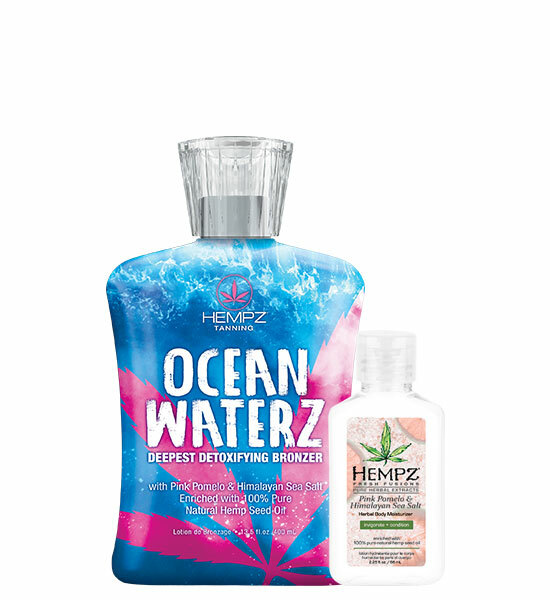 Hempz Ocean Waterz gives you endless deep and completely unique color.